A new townhouse project in Pickering is harnessing the power of the sun and the power of the next generation at builder Marshall Homes. The Altona Towns — a 27-unit townhome project backing onto Petticoat Creek conservation land and across from the 53-hectare Altona Forest — will have its own community solar grid that will offer homeowners hydro savings and provide backup power in the event of a blackout. It will also be monitored for research into the benefits of a small, homeowner-shared endeavour to generate electricity credits. 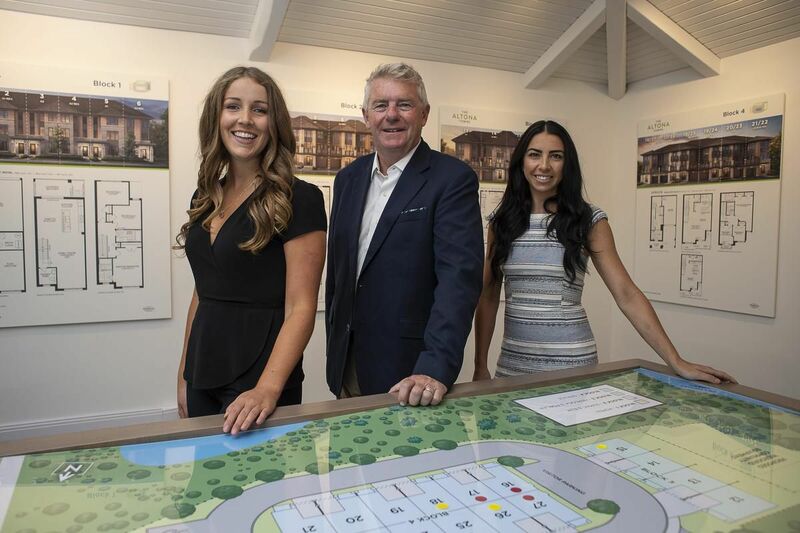 Other features of the townhouses include modern, open-concept designs, parking for two cars and flexible layouts have largely been due to the influences of two young women who work for Marshall Homes: Lindsay Pollard, 31, decor and marketing manager — and daughter of company president Craig Marshall — and project manager Samantha Bateman, 25. Both appreciate that Marshall Homes is a smaller building company. “I enjoy having a relationship with every homeowner. I know everyone’s face and they all have my number,” Pollard says. Pollard and Bateman worked with architect Stephen Hunt of Hunt Design Associates, to determine the look, layouts and finishes for the townhomes. Pollard studied business and interior design before joining the company’s decor department in 2011. Bateman, who studied urban planning at the University of Waterloo, did co-op placements at Marshall Homes before completing her studies and becoming an employee. “Sam and I work well together,” says Pollard. “We come from different backgrounds. I have a family, she is single. Sam works from the viewpoint of a first-time buyer, while I’m looking at how a family can enjoy the homes. The three-storey townhouses start at $589,990 for 1,617 square feet for two bedrooms and 2-1/2 bathrooms, in a back-to-back model (with no backyard), and go up to $699,990 for 1,927 square feet with four bedrooms and 3-1/2 bathrooms. Higher priced units have yards; the homes come with a stainless steel appliance packages, nine-foot main floor ceilings, granite kitchen countertops, extended height kitchen cabinetry air conditioning and laminate flooring on the main level. Bateman and Pollard know that living space is a priority with buyers and worked with designs to incorporate as much as possible. The Altona Towns have quick access to the nature and walking trails of the adjacent Altona Forest, and are just eight minutes from the Pickering GO Station and less than 10 minutes from Highway 401 or Highway 407. Numerous amenities are in close proximity. The Altona Towns project represents the first residential application of Virtual Net Metering in Ontario — and perhaps in Canada, says energy consultant Alan Clarke. It’s a bill-crediting system for a community solar-energy structure, where electricity credits generated by the grid will be shared equally among homeowners to offset their hydro costs. Clarke says the Altona Towns solar project is small but will be used for research and for “proof of concept” to show how this type of micro-grid can benefit the regional grid, the environment and the community. Opus One, a tech company with software that monitors and controls micro-grids, will manage the Altona Towns grid. Local hydro distribution company Veridian Connections has also partnered on the micro-grid project. The goal is to achieve 10 per cent savings; actual savings will depend on the system performance and prevailing energy rates. Altona Towns will also have a pay-per-use vehicle charging station with revenue going to the condo corporation. As well as being connected to the regular hydro grid, the Altona homes will also have a community rooftop solar array on one of the four townhouse blocks facing south. While feeding into the regional grid, the community micro-grid will also have a large, stand-alone Tesla battery (called a power pack) to store electricity to provide backup power to the 27 townhomes in the event of a blackout. An aspect of the research will include a Tesla Powerwall in one homeowner’s townhome that can be charged during off-peak hours and used to offset electricity use during the day when hydro rates are higher.